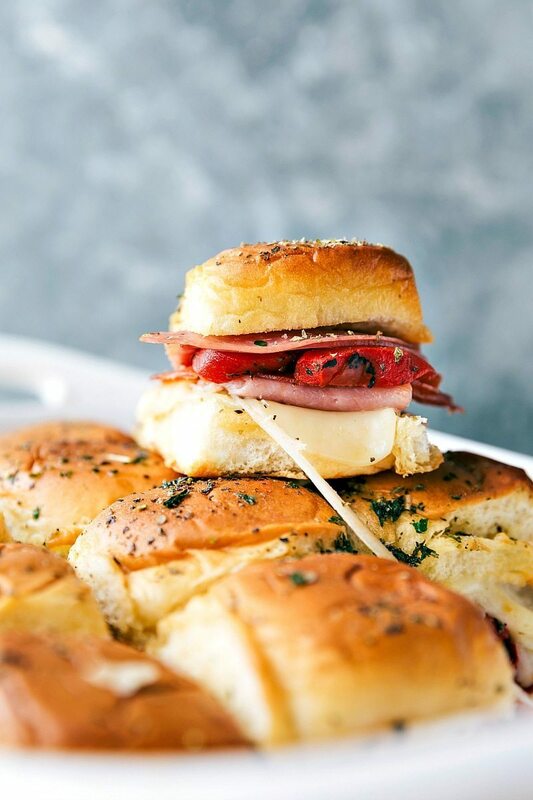 Easy baked Italian sliders with ham, salami, pepperoni, roasted red peppers, and provolone. 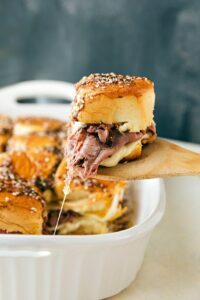 These sliders are so quick, easy, and make the perfect appetizer! Even though I make a lot of food and love to cook, not everything I make actually turns out…well…edible. Let’s just say, I am no stranger to recipe development failures. ? On those days, we like to go out and grab soups/sandwiches or a pizza while the toddler incessantly reminds me to never make “that” again. As we pile into the car, the toddler always puts in his request — his favorite place to eat is Zupas. (Or as he calls it “Uppas”.) A few reasons why he loves Zupas so much: 1. He promptly eats both mine and his dad’s chocolate-covered strawberries that come with our meals, 2. He eats their soda crackers like they’re going out of style, and 3. He is completely obsessed with the Italian Club Sandwich. He’s not a fan of their kid meals (seriously how does my 3-year-old eat everything EXCEPT mac & cheese?! ), so I always get the Italian sandwich with a various soup or salad. Half of that sandwich is always, very gratefully, his. I’m convinced he could eat that sandwich every single day and never get sick of it! So, of course, I’ve had to re-create an Italian club just for him. Although, these really aren’t a re-creation of the Zupas Italian Club sandwiches being as they are baked and in slider/appetizer form, but they’ve got all the essentials — delicious meat, great seasoning, perfect bread, melty cheese, and a DIPPING SAUCE. These sliders are packed with meat, so feel free to scale back on how much you add. They are so easy to customize — change out the cheese, leave off the peppers, increase/decrease seasonings, etc. They also don’t store too bad. Of course, they are the very best hot out of the oven, but if you need to store them; they do pretty good. Wrap them tight in foil and store in the fridge and when ready to enjoy; heat them up in the microwave! 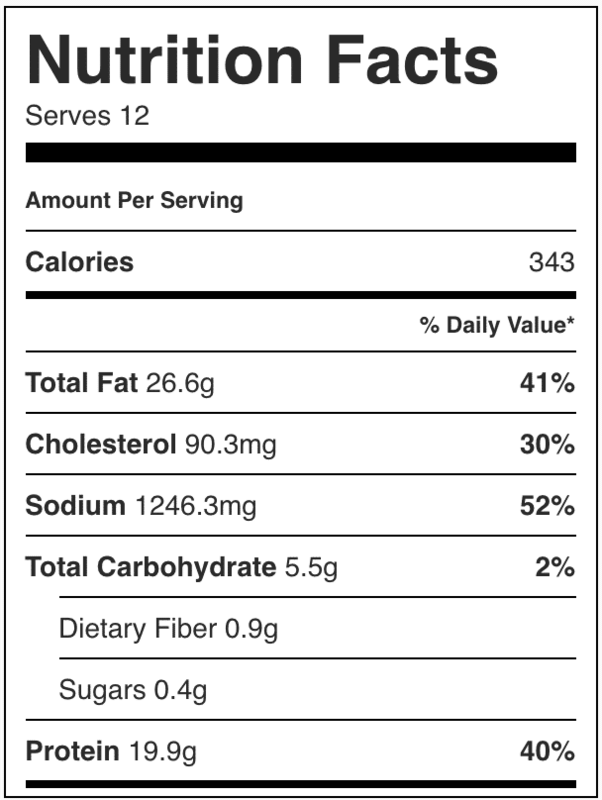 Just make sure to add these to your Super Bowl menu. ?? Preheat the oven to 350 degrees F. Rub 1 tablespoon soft butter over the bottom of a 9 x 13 pan and set aside. Slice the Sweet Rolls in half (see video tutorial) to separate the top of the rolls from the bottom. Place the bottom half in the prepared pan. In a small bowl, combine 5 tablespoons butter and slightly soften (you do not want to melt it!). Mix in the 1/2 tablespoon Italian seasoning and dried parsley. Evenly spread this mixture on the bottom half of the rolls. Fold 1 piece of ham into a square (again video tutorial is helpful) the size of one of the rolls and place on top of the roll. Repeat for 11 more pieces of ham. 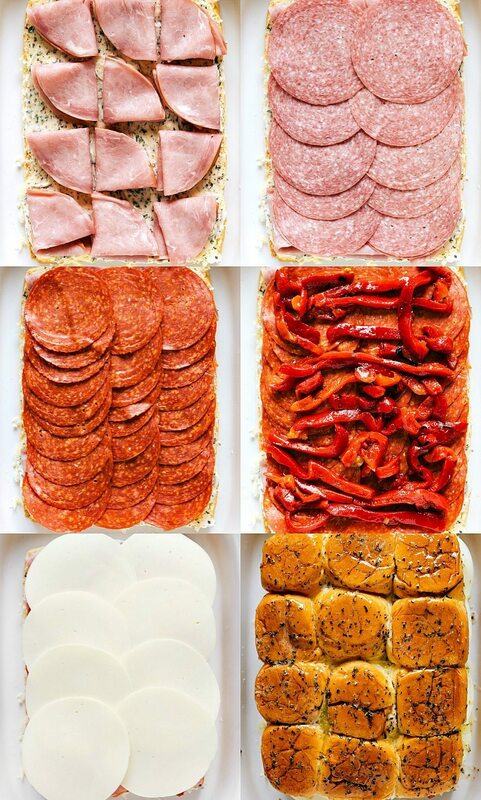 Evenly top the ham with the salami, pepperoni, roasted red peppers, 12 remaining slices of ham, and Provolone cheese. 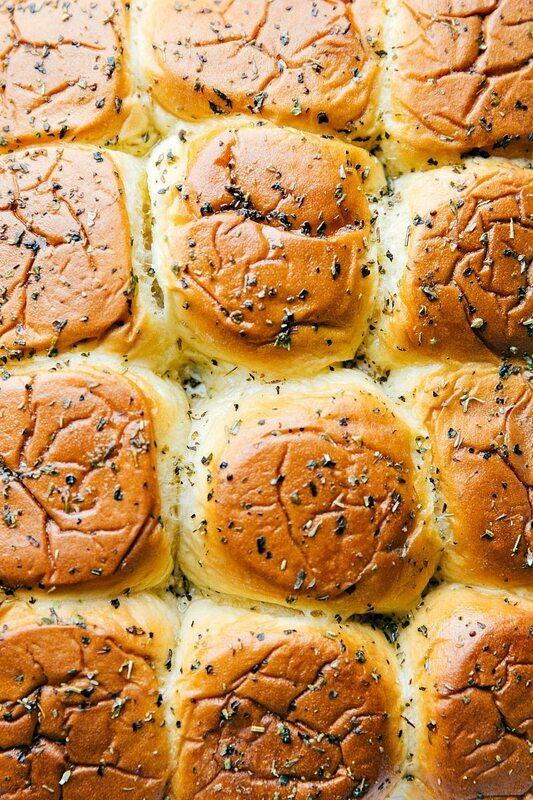 Place the top of the rolls over everything. Melt the remaining 2 tablespoons butter and add in the remaining 1/2 teaspoon of Italian seasoning. Whisk together. Pour and spread the butter mixture evenly over the rolls. Cover the sandwiches with foil and bake for 10 minutes. If desired serve with warmed marinara and enjoy immediately. So happy you enjoyed them!! Thanks for the comment Mary! Fantastic idea for the super bowl night. 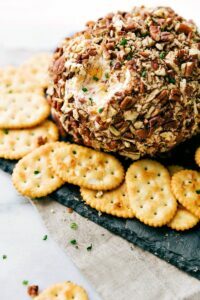 Easy, meaty and cheesy! Your 3 year old is my favorite! Who wants to bother with the kids menu when they steak half of mommy’s sandwich? This looks fantastic! Your 3 years old boy is the cutest. I love them you talk about him on the blog 😉 And this sandwich looks insanely good!!! Hi Kelly! I’m so glad you have you and I’m thrilled you’ve been enjoying my recipes! 🙂 The rolls shouldn’t be soggy; did you melt the butter or just soften it? And did you bake them for the full amount of time (uncovered for the last bit)? I made these the other night and the flavor was amazing! The only trouble I had was that the bottoms of the sandwiches got soggy. Is that normal or did I mess something up? Shouldn’t be soggy! Did you melt or soften the butter? 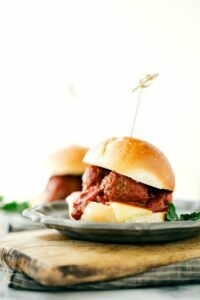 I made these sliders last night and they were amazing. I did not buy Hawaiian rolls I made them. This is a new favorite! Thank you for sharing! Just wondering if these can be made ahead of time or if you need to put them in the oven immediately? I wouldn’t make them too far in advance. They are best baked right after being assembled 🙂 Enjoy! These sandwiches were ridiculously good! We made them for the Rose Bowl. My kids gobbled them up. I made a little dipping sauce with mayo and red wine vinegar rather than a marinara. 5 stars! 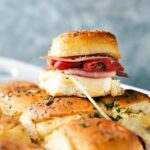 I made the Italian sliders – they were awesome! I used focaccia bread instead of Hawaiian rolls- just split it horizontally. I toasted the bottom half to prevent the bottom of the sandwich from getting soggy- it worked. Will make again.